In one bowl combine all the dry ingredients: flours, baking powder, baking soda, cinnamon and salt. In another bowl, whisk together the milk, cottage cheese, butter, egg yolks and vanilla. Add the milk mixture to the flour mixture and mix until the batter is just combined. Set aside. Using a mixer, whip the egg whites until stiff peaks form. Preheat your griddle to a medium heat. 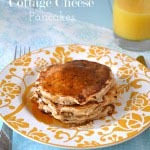 And when you are ready to make your pancakes, use about 1/4 cup of batter for each pancake. If you want larger pancakes, use 1/3 cup. The pancakes are ready to flip when the edges of the pancake appear dry. Serve with syrup and fresh fruit! Yum!